He is the rarest of quarterbacks, capable of making the impossible look routine. So where did his gifts come from -- and where do they lead from here? This story appears in ESPN The Magazine's November issue. Subscribe today! I went to the bottom of the internet trying to understand what it's like to have an arm like Patrick Mahomes'. I found a throw so rare that it technically doesn't exist, erased on account of a holding penalty. November 2014. Mahomes is a 19-year-old true freshman at Texas Tech, facing Oklahoma, in only his second start. It's third-and-10 at the Sooners' 39-yard line. He's been coached to look at a pair of receivers in sequence and, if they're both covered, make a play. One, two, go. He takes the snap and is under immediate pressure -- "one, go" -- and he scampers left, not fast but elusive, away from the rush but into a trap. He's within a yard of the sideline and all four Sooners defensive linemen are closing fast ... until, with his weight moving left and a rusher's helmet at his chin, Mahomes snaps his arm -- in that instant, it's his only body part in motion, as if isolated for maximum effect -- and the ball assumes a trajectory that seems impossible without more of a windup, the physical expression of a metaphysical quality, a radical confidence known only by a blessed few. The ball hisses; it spirals fast and tight; it seems to alter the physics and change the possibilities of a football field -- hovering low as it sails across and deep -- until it sticks to a receiver's chest in the end zone as Mahomes hits the ground. I watched that throw 20 times. I saw improvisatory football genius and sheer stones. I saw a man making calculations and assessing risks I couldn't compute. I watched the throw until I was certain of what I was looking at. And then I sat down with him and raved about passes like it. And he took the compliments with a dull stare, as if none of what I attributed to it ever occurred to him. It was just a throw. A throw he always makes -- and has made since he first held a ball. In any given generation, there are only a handful of truly transcendent arms. These guys are born, not made. If you don't have it, you still can be a good NFL quarterback if not paid like a great one. If you have it and waste it, you'll be a 30 for 30. But if you have it and don't waste it, and combine it with an Academic All-American's mind and a craftsman's work ethic -- well, that's what I want to explore with Mahomes. On an October afternoon in an office at the Chiefs' facility, Mahomes doesn't look like he wants to be explored. He looks explored out, polite but also maybe existentially exhausted from having his life change forever this season. 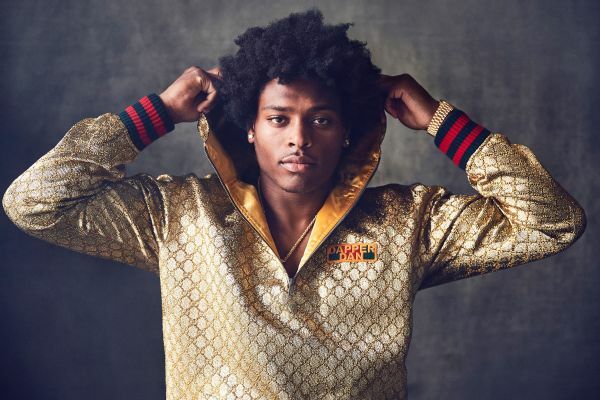 He is 23 years old, without even 16 games under his belt, and he has a game-worn jersey in the Hall of Fame and leads the league (through Week 9) in touchdowns and yards and is second in passer rating. It's been a year. Most impressive, he has normalized the impossible, making throws each week that defy reason and kinesiology. The other day, in Mahomes' apartment in the Country Club Plaza neighborhood of Kansas City, his grandfather asked him, "What's it like to be famous?" For one thing, it means he eats less ketchup. He spent most of his life putting ketchup on everything. He would get bottles of it for his birthday. But now that everyone is watching every move he makes, he is sheepish about ordering ketchup. At a restaurant recently, his mom, Randi, recognized an unfilled desire as he dove into a steak. "Just ask for it," Randi said. "I know you want it." Patrick wouldn't. So she asked for the ketchup and slipped it to him. But the intersection of fame and ketchup is a story for another time. We're here to talk about his arm, so I ask him a question I know better than to ask an obsessive technician like Tom Brady, for example. "Have you ever had to think about throwing?" I'm standing with John Elway as we watch Mahomes warm up at Arrowhead Stadium before the Chiefs play the Broncos in late October. Mahomes rolls left and throws deep right, then rolls right and throws deep left. He tosses it 60 yards without a strain or grunt. He looks like he's goofing around -- even checks his phone between reps -- but this is actual practice. In games, he makes those throws. A few Broncos coaches watch Mahomes, seduced by the spectacle of it all. He has skills at his command that are the envy of anyone who's ever played quarterback, and if you've ever thrown a ball well enough to have an idea of how hard it is to do what he does, it's even more fascinating and thrilling and full of lovely subtleties, like the angle at which the nose rises and falls, how the ball seems to gain speed with distance rather than lose it, violent yet catchable. These passes change more than a game's momentum. They suspend time, forcing you to look up from your phone and making you wonder what it feels like to unleash such force. Elway knows. I ask Elway, "When your arm was its strongest, what was it like to throw?" "I don't know," he says. He chews on it for a second and gives me a football version of the "I could always just play" scene in "Good Will Hunting." "You just feel like you can do anything." To succeed in the NFL, most players have to come to terms with their limits. You learn to work within and against them. But if you are born with an arm like Mahomes' or Elway's, it allows you the blessing of never having to reconsider yourself -- unless, of course, a few painful postseason losses force you to reconsider everything. Mahomes might not think a lot about his own throwing, but many close to him have spent a lot of time thinking of ways to get him to slow down. His father, Pat, was a pitcher for 11 years in the majors, and the family often lived in apartments and hotel rooms in cities where he played. As a toddler, Patrick would go to the ballpark with his dad for batting practice and then come home, watch the game on TV and throw during commercial breaks. It was fun and exhausting. Randi would toss a ball into a corner or down the hall, hoping to buy herself a few moments of peace. "I thought, 'I can read one more paragraph of this book until he gets the ball,' " she says. When Randi and Pat signed Patrick up for T-ball in their hometown of Tyler, Texas, the 4-year-old was so advanced he was traded for two players -- Texas sports, man -- and moved up to play coach-pitch with older kids. At the first practice, he scooped a ground ball at shortstop and fired to first, hitting the first baseman between the eyes and shattering his glasses. "I thought everybody could catch," Mahomes says now, laughing. 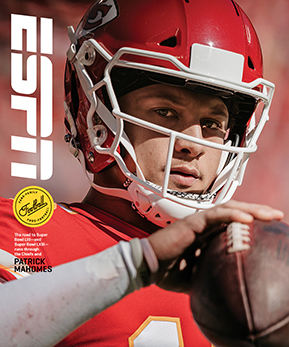 The challenge of Mahomes' childhood was the challenge of the gifted. How best to teach him? Should you even try? Pat tried to build his son's arm strength through an array of baseball drills, beginning with long tosses and moving toward throws from different platforms, with both feet parallel or one foot planted the wrong way, hoping to help Patrick find his most powerful release point. Turns out, every release point was powerful. He not only intuitively threw at varying angles -- could throw classically, or at three-quarters, or from his hip -- he intuitively saw varying angles and the best way for a ball to reach its target. "It turned out to be a perfect storm," Pat says. When Patrick was nearing middle school, he started to play football in the backyard with friends. One day, he threw as hard as he could to his dad. It's a throw Pat still remembers a decade later, not only because of its force but because it was a declaration of sorts. His son would chart his own path. "It felt like the nose of the football went through my hands," Pat says. Mahomes has the type of arm that can lead to assumptions. When he was a kid, he entered a summer football camp wearing a baseball hat turned backward. Adam Cook, the camp's quarterbacks coach and later Patrick's head coach at Whitehouse High and now one of his best friends, decided to test him. He had heard of Patrick's arm strength and low release point -- coaches tend to see a three-quarter release as the knee-steering of throwing motions, careless and too cool -- and thought most kids with that resume were spoiled know-it-alls. Cook approached him and said, "Hey, turn your hat around so I can talk to you." Patrick turned around his hat, no questions asked. Although his talent has always meant the game has come easily to him, at heart he's a conformist who is grounded and eager to work. "Dad, I just want to be coached," he would tell Pat. In middle school, he worked with a coach named Reno Moore, who would ask Patrick to lie on the ground next to a football and, when Moore gave the word, jump up and throw to one of three holes on a stand-up net to quicken his release. "His pure arm strength was phenomenal," Moore says. "He'd make you pull out your hair trying to get him to be exact on his footwork and timing, but finally we just said he's good enough to do some things that are special." At Whitehouse High, Adam Cook and his brother, Brad, the offensive coordinator, called a lot of quick screens and marveled at how fast the ball came out of Mahomes' hand. Years later, Brad analyzed all of Mahomes' quick screens and found that he released the ball in 0.58 of a second, compared with an average of 0.67 for all Whitehouse quarterbacks since. 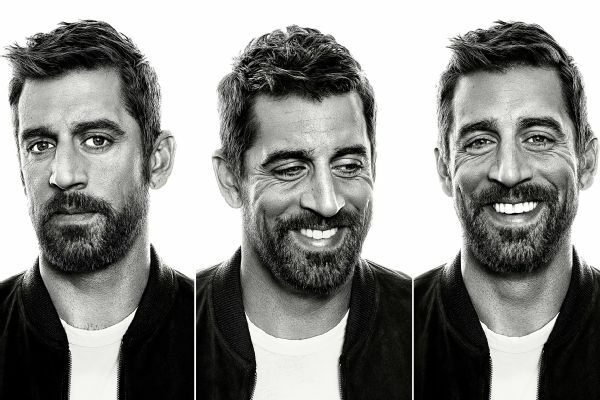 Adam Cook's son, Sam, was a ball boy during Mahomes' years, and he idolized Patrick -- not just because Patrick went out of his way to make him feel part of the team, or because Patrick would remember teammates' birthdays and ask coaches to announce them at practice, but because he wondered what it was like to have that arm. "You watch him make plays and think, 'Maybe I could do something like that,' " Sam says. But of course, he couldn't. Nobody could. "God didn't give out many arms like that," Adam Cook says. The arm has given Mahomes the blessing or curse of never having to be desperate. All of the future Hall of Fame quarterbacks today have faced a moment in their lives when football could have moved on without them. The closest Mahomes came to that was during an Elite 11 contest in high school. He was tired and raw; he had pitched five innings the day before. He failed to qualify. Cook was angry. Pat Sr. was really angry. Was Patrick angry? Was that his signature scar, a moment -- like Tom Brady's draft slide or Drew Brees' shoulder injury or Aaron Rodgers' failure to get a single Division I offer out of high school -- that becomes lore in retrospect? No. "East Texas isn't known for producing quarterbacks," he shrugs. "I was never really on the football circuit. I wasn't the type of guy that put my name out there." His arm gave him confidence that it would all work out. During his senior football season, in 2013, he threw for 50 touchdowns and ran for 15 more. Baseball chased him, but he was bored with the game and told teams he would play only for a $2.5 million bonus, a figure he later told The Kansas City Star he had invented just to dissuade them. Football gave him a platform, a blank canvas on every play. He loves "the daily grind of dissecting and learning about defenses. Just having a new challenge every week." In a playoff game against Poteet High, Mahomes spun away from linebacker Malik Jefferson, who now plays for the Bengals, and launched a deep pass down the right sideline for a touchdown. Pat Sr. later called it the most memorable play of his son's career -- and noted it's the type of play Patrick has made "his whole life." Watch Mahomes roll away from the Patriots' rush and launch a 67-yard touchdown to Kareem Hunt and you know what he means. Kliff Kingsbury sits at the head of a large conference table on an October Thursday. We're in the Texas Tech football building. A framed Mahomes jersey hangs on one wall in his office, and a Mahomes painting leans against another. Few people in America know quarterbacks like the Red Raiders' head coach. He was a star at Texas Tech, studied behind Brady and Brees in the NFL, and coached Case Keenum and Johnny Manziel in college. NFL coaches shamelessly steal from his playbook. Andy Reid recently told Sports Illustrated he was a "genius." "He's just being nice," Kingsbury says. "He feels grateful to me for making sure Patrick is alive and didn't die in college." He turns on video of Mahomes in college, looking very alive, offering a familiar display of the spectacular. Mahomes rolls right and throws 30 yards like he's skipping a stone. "Most humans can't do that," Kingsbury says. Mahomes wings a deep out like he's throwing a Frisbee forehanded. "The rest of us strain to throw the balls he throws," he says. "I never saw him strain, ever. Didn't matter how far downfield." I press Kingsbury for an evolution in Mahomes' release, arguing that it has to have changed. I mean, Brady and Rodgers have reinvented their motions, if not themselves, over the years. Kingsbury coached Mahomes to carry the ball higher, but that was it. "There was a purity to it," Kingsbury says. In three years in Lubbock, Mahomes never had a bad day throwing. He was never off. So maybe it's no surprise that Mahomes grew bored with Mahomes. Maybe that's how it goes when you set an NCAA record with 819 yards of total offense in a single game, or when you routinely launch 85-yard passes in pregame warm-ups. Kingsbury had to be creative to keep coaching him. A few days each week, he would set up nets with three targets and join Mahomes and Tech's backup quarterback, Nic Shimonek, in a quarterback version of H-O-R-S-E. The games got heated and insane, with the quarterbacks bouncing footballs off the goalposts or over the crossbar. Kingsbury ended up winning a lot -- he had the best touch -- but one day, for kicks, they mixed in left-handed throws. Soon it became part of the routine. 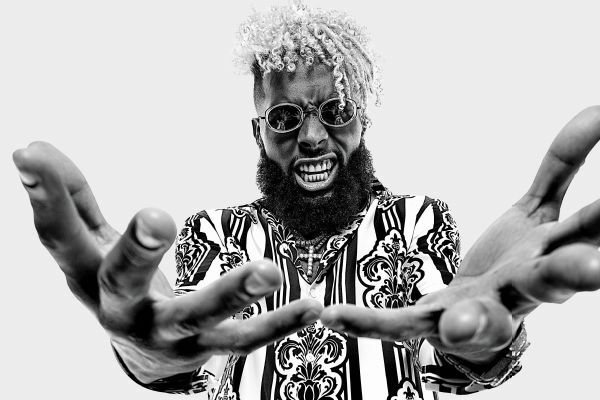 Kingsbury and Shimonek were the only people in America not falling off their couches when Mahomes, running left and with Von Miller at his ankles against the Broncos in Week 4, transferred the ball from his right to his left hand and tossed it to Tyreek Hill for a first down. "It was practiced," Kingsbury says. He is trying to tell me that there was an evolution. I'm just looking for it in the wrong place. Most quarterbacks go to college to learn how to play in the NFL. Mahomes went to learn how to throw left-handed. At the beginning of each year, Mike Sheppard, a former college head coach and assistant under Bill Belichick and Mike Holmgren, drives a short distance from his house in the San Clemente hills to the Exos facility in Carlsbad to join another coach and friend of his, Bill Cunerty, to prepare quarterbacks for the draft. For six weeks in 2017, Mahomes was a client. Sheppard has known Andy Reid since the late '70s, when he saw him at Glendale Community College and brought him to BYU, where Reid ended up meeting his wife, Tammy, and launching his coaching career. One day between the 2017 NFL combine and the draft, Reid called Sheppard to ask about Mahomes. "I'm just doing some due diligence," he said. "I won't keep you long." Sheppard had a binder full of Mahomes notes. He had listed 11 items as "Improvements," from "snap count" to "drawing TTU protections" to "two hands on the ball." But it was revelatory for what it lacked: There was almost nothing in his notes about Mahomes' release. Quarterback coaches love to credit themselves for cleaning up the motions of top prospects during draft season, but Sheppard instead told Reid, "There are a lot of strong arms but not as accurate." Reid tried to mask his enthusiasm. How was Patrick to coach? Did he listen? Does the material transfer easily? Sheppard had his own theory to gauge a quarterback's intelligence. If a quarterback has great grades, Sheppard knows he's a grinder. Patrick was an Academic All-American, Big 12 scholar-athlete of the year and a regular on the dean's and president's lists. "He's a good student and hard worker," he said. Calls like this usually last about 15 minutes. This one lasted 45. "It took some time to get through the checklist," Reid says now, straight-faced. "Andy was excited about him," Sheppard says, "but he didn't want anyone to know." Mahomes suspected it. Before the draft, Reid interviewed Mahomes in Kansas City. It was a six-hour meeting. "We tried to bury him" in football minutiae, Reid would say later. He knows better than most that it's possible to produce an outstanding coaching career with good quarterbacks but almost impossible to win a Super Bowl without a transcendent one. In the end, the fit between them felt right. Despite the draft-day groupthink by many other teams -- Mahomes was too raw, his ungodly statistics in Texas Tech's offense were untrustworthy, Mitch Trubisky was the superior prospect -- the Chiefs climbed 17 picks to select him 10th overall. 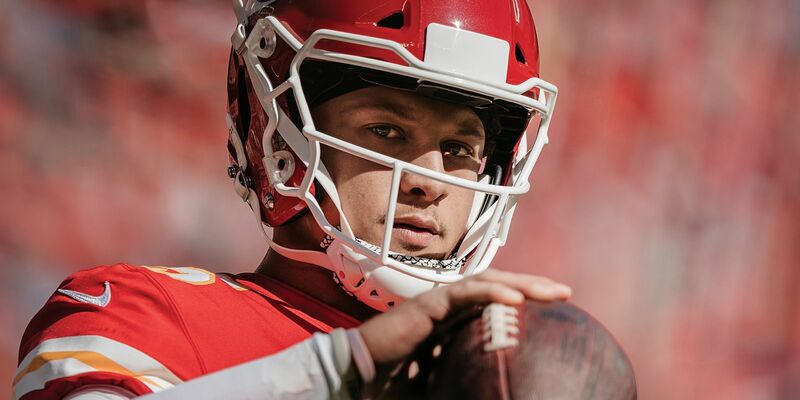 Once Mahomes was a Chief, Reid learned that the strength in his arm didn't come just from his arm. It also came from his wrist. "He just kinda flicks it," Reid says. When Patrick was learning how to throw, Pat Sr. always told him to "get his wrists involved." Pat wanted his son's fastballs to have the sensation of rising -- "His wrists just got stronger," he says -- but he had no idea that it would come together in moments like it did in the third quarter against the Jaguars in Week 5. Mahomes scooted up in the pocket, but his cleats caught on the turf. He threw with his feet shoulder-width apart, without a windup or follow-through, like he threw a dart. The ball hit tight end Travis Kelce in stride 25 yards downfield -- a throw that forces you to wonder, with sincere hyperbolism, if a generational quarterback doesn't stop himself, can he be unstoppable? Mahomes is standing at his locker after the late-October Broncos game, pulling on a white sweater. He has only one locker right now, rather than the customary two for superstars -- we all need things to strive for -- but he looks comfortable and at home around the guys after a win, just like visiting his dad in a big league clubhouse. He threw four touchdown passes but left plenty of plays on the field, including one when he rolled right and had Hill open on a post, running across and away, a throw the Chiefs would've never called for Alex Smith. But Mahomes saw Hill too late. Around the corner is a private party the Chiefs host for friends and family after every home game, and Patrick is in a hurry to see his folks. It all reminds me a little of Tom Brady in 2001, the mystical embryonic stage of something special. Pat and Randi have the adrenalized exhaustion Tom Sr. and Galynn Brady had back then, flying across the country every weekend, on a ride they had to soak up because nobody knew when it would end. "I might skip Cleveland," Pat Sr. said the night before the Broncos game of the Chiefs' upcoming opponent, before thinking better of it. "Nah, I'll go to Cleveland." Nobody knows where Kansas City's season will end, but it's well-known that for the Chiefs and for Reid over the past two decades, it has ended early. Mahomes is a limitless quarterback leading a historically limited team. The Chiefs have been careful with him publicly, at once allowing him to be celebrated but trying to limit the toll, not wanting the hype to short-circuit what could be their year. Right now, at least, Mahomes is immune to the doubt that creeps into teams that always come up short -- that even crept into Elway in the years after he learned a wondrous arm alone gets a team only so far. Fear is his biggest enemy. In the Kansas City offices, I ask Mahomes whether there's some highlight he goes back to when he needs a lift. "I never really watch anything that helps me get a confidence boost," he says. "I pretty much just keep it moving and keep it rolling. I feel like even if something goes wrong, I have confidence in myself and my team that we'll fix it. Our team thing is, Let's Roll. Whatever happens, I'll bounce back." Imagine living that way, perpetually liberated. Maybe someday later in his career Mahomes will have to try to recapture that feeling, when some inevitability of the NFL sets in. Or maybe not. Maybe a rare arm allows for an even rarer mind. In the fourth quarter against the Broncos, the Chiefs were up 10, but Denver was slowly creeping back into the game. Mahomes started to scramble but threw to Kelce high and hard and into the arms of Broncos safety Justin Simmons. Mahomes headed to the bench, irritated but not crushed. Four plays later, the Chiefs forced a Keenum fumble, and Mahomes leapt off the bench, hugged a few defensive players and yelled, "Thanks for picking me up!" Then he snatched the ball from them and started warming up, his release fluid and clean and on point, all that is required of him and all that he has ever required of himself. Mahomes never told me what it feels like to make extraordinary throws, only intimating that those throws don't feel extraordinary to him. That's the gap between him and 99 percent of the men and boys who will drop back into a pocket this fall. But the 99 percent can have a taste. In mid-October, Sam Cook made a throw he'll remember for the rest of his life. The ball boy is now a freshman-team quarterback at Whitehouse High, playing on the same field his hero did, and in a game against Jacksonville, he danced left and saw a receiver running to the right. It's the throw -- late and over the middle -- quarterbacks are told never to try. But Sam couldn't resist the chance, not just to hit a pass but to hit a Mahomes pass, with all its danger and glory. He threw like Patrick, a quick three-quarter release, and hit his man for a big gain as the crowd exploded. A current shot through him like lightning. "Nothing like that feeling," Sam told me later, still buzzing. Does Mahomes know that feeling, or is he unaffected by the rush? He had to leave the office in the Chiefs' facility before I could ask. But my bet is that he knows. And that the game for him now is to never stop to think about it. Seth WickershamWickersham is a senior writer for ESPN Digital and Print Media. He can be reached at Seth.Wickersham@espn.com and @sethwickersham.